Heart valve replacement has conventionally been done by an open Heart surgery for several decades. The patients had to undergo major surgery on heart lung machine and the chest had to be opened in the mid breast bone with a long cut. The patient took almost 3 months to recover from the surgery and be on life-long blood thinners. Today the science and innovation has evolved so much that, the Heart valves can be changed by catheter based technique similar to angioplasty and stenting. India has a huge population of heart patients and aortic stenosis (narrowing of aortic valve) is a common valvular heart disease which can afflict the people from birth due to congenitally abnormal valve, could afflict the aging population because of aging and calcification or due to rheumatic affection.30 to 40 % of these patients were found to be unfit for surgery and they would die early. It doesn’t need any more to open and the patient is ready to go home fit and fine by the third day. Thanks to the percutaneous valve (through puncture in skin) replacement technology. Transcatheter Aortic Valve Replacement (TAVR) is one such catheter based easily done treatment by which the valve replacement is done. In TAVR, the artificial heart valve is mounted or loaded on the tip of the catheter (tube) and is inserted through a small puncture in the groin. The catheter is taken to the area of heart where the original disease valve has to be replaced. The artificial valve is released and implanted at the place. The old valve is crushed and stays behind the new valve. The new valve starts functioning immediately. The puncture site is sealed by preplaced special sutures. The patient stays one night in the recovery and is fit to be discharged by the third day. All this is done without general anesthesia under conscious sedation. TAVR has brought new revolution in the field of valve therapy and especially, a great option well established for elderly population who are unfit for open heart surgery, those would do not want an open heart surgery, people who have had their previous open heart surgeries and can’t have a second surgery or have many co morbidities that make them high risk for an open heart surgery. TAVR is a boon for people who are unfit for surgery. Now the trend is changing and intermediate surgical risk patients can also have this treatment done for them. TAVR has brought new revolution in area of minimally invasive technique of non-surgical valve replacement and enough scientific data supports its safety, efficacy, benefits. Recent trials have shown good results in low and intermediate surgical risk patients as well and it appears that TAVR may very soon replace surgical valve replacement in the coming years. Fortis escorts heart institute is a Centre of excellence for Valve therapy and highest number of TAVR cases have been done. The first in human study was done by Dr Ashok Seth, the chairman of cardiovascular sciences in 2004. The TAVR program was approved by the government of India from 2016 and from then onwards numerous patients have benefited out of this procedure. The oldest patient who underwent successful TAVR is 95 years gentle man and is doing well. Several patients of different ages have undergone the procedure successfully and speak their stories about the happy experience they had and their miserable life transforming to a healthy active life after simple easy non-surgical technique of TAVR. chest getting opened without the valve getting replaced. Thanks to TAVR technique, his valve was replaced in the next few days and happily he went home the third day. The happiness was limitless. Another patient underwent surgical valve replacement in 2003 and 15 years later he was 76 years old with recurrence of his old symptoms, so symptomatic that he was unable to completely eat his breakfast because of breathlessness. The previous valve had actually degenerated and spoiled. He had already an open heart surgery done in past and could not afford to have his chest opened again because of many other illness catching up with age. He got a new “Valve in Valve” implanted by TAVR. After TAVR, the next day he exclaimed Wow! I ate my complete breakfast and walked around. TAVR began his life fresh again. Also, 56 years man had morbid obesity asthma, home dependent oxygen support and an aortic valve disease compounded his bad medical condition. No surgeon or anesthetist was ready to touch him for valve replacement. TAVR was done without general anesthesia, just simply by conscious sedation and his condition improved remarkably. There are many more happy stories of patients who have undergone TAVR. The procedure is simple, safe, non-surgical, done under conscious sedation or very short GA, does not require life-long anticoagulation and has excellent durability. It has been approved by every international regulatory authorities including the FDA, CE and the India’s DCGI. The little risk of procedure is similar to that of an angioplasty. Summarily, it can be said that TAVR is safe standardized procedure being done across the world with well supported clinical data and our Indian patients should not be devoid of availing this procedure for treating their valve condition if required. Fortis escorts Heart institute takes its pride in being the first in human study for TAVR under Dr Ashok Seth, chairman cardiovascular sciences. 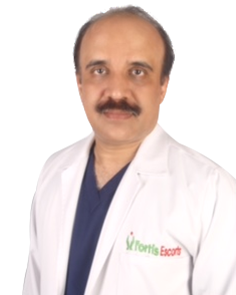 Dr Ashok Seth and Dr Vijay Kumar, Principal Consultant, Interventional Cardiology are running the Valve clinic and have created Fortis escorts heart institute as a Center of excellence for TAVR -procedure for the patients and also teaching TAVR technique to the budding interventional cardiologists of the future. The Heart Team for TAVR has imaging specialists, cardiac surgeon, anesthetist, nurses, technicians who are all especially dedicated for TAVR. “We have replaced valves successfully by this new technique for patients who were 80 plus and 90 plus and had severe narrowing of aortic valves. They never dared to have an open heart surgery at this fragile age or they were declared high risk or inoperable by the surgeons due to several other medical illnesses and major organs not functioning properly. Some of the patients who had previous by-pass surgeries and experienced the three long months of recovery, were just not wanting to have a second surgery for their valve problem catching up late in life. Today, TAVR has also brought a new lease and happiness of getting a second valve in the patients who were operated a decade back and their valves have failed. This procedure has been done for more than 5 Lakhs patients globally.